Papa came home from the hospital last Tuesday and everyone is very excited to have him home. It is an adjustment for everyone - while in the hospital, he became accustomed to relative quiet and order, two things that are in short supply around these parts. And we are having to learn a new way of interacting with him. Thankfully, Gabriel's running-start-around-the-knees hugs haven't knocked him over. We have a long road ahead of us yet. Next week, hopefully, he will start outpatient therapy. We are incredibly lucky to have the gift of time for him to recover. Thanks to the generosity of his friends and colleagues at work, we have received enough donated leave that we will not have to worry about rushing him back to work before he is ready. Everyone has been very kind. I love the O+S Sailboat pattern. It was the first O+S pattern I ever bought. 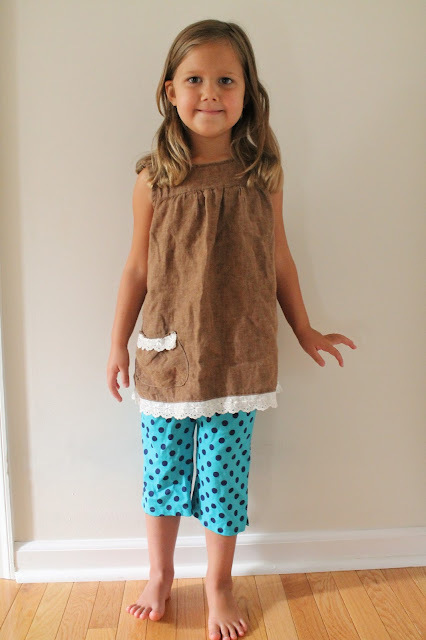 I have sewed the pants three times now, the top three times (once as a dress) and the skirt once. Zoia requested these pants several months ago. The fabric is a remnant-bin quilting cotton from Joann's. it is a lighter weight than most quilting cottons, and I think it cost about $1.24, so I grabbed it. 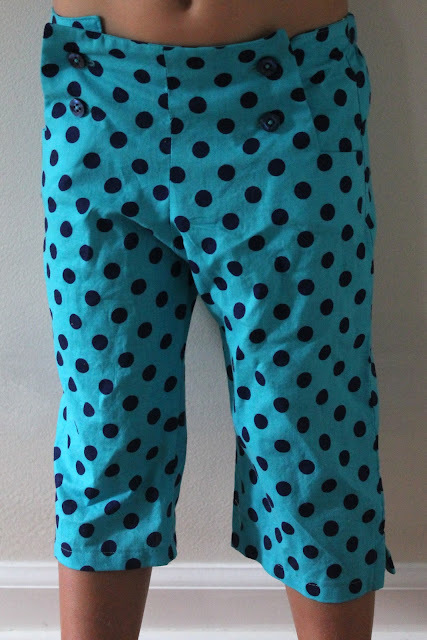 The dots are navy on a turquoise background. I sewed the pants, she tried them on, then put them in her drawer and completely refused to wear them. 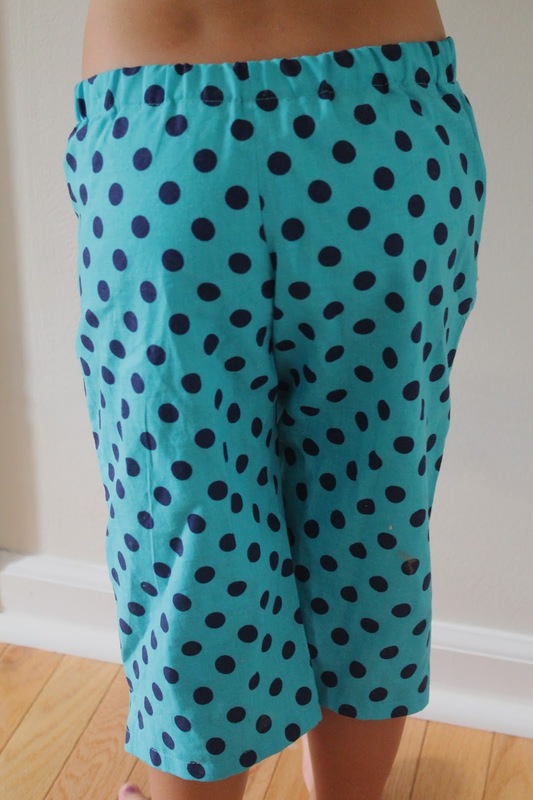 Then one night last week she suddenly declared that she would wear the polka dot pants the next day. I took advantage of her acquiescence and had her pose for some photos (good thing, too, as she has not worn them since). One of the problems I found with these pants when I made them for my girls as babies is that they don't have much cloth diaper room. And even without diapers, the rise is a little low in the back for my be-junked 4.5-year-old. It was a good wardrobe day all around when I managed to talk her into pairing them with one of my favorite makes ever - a sweet little linen dress sewn about two years ago from a Japanese pattern book. (Pattern #30 from Japanese book Boys and Girls Clothes #1848, in the 100 cm size). Here it is right after completion. She was 2 years and 8 months old. Oh my. Where did that time go? She loved the dress when I made it. She wore it all the time. Last summer it mostly just sat in the drawer, and now I have to cajole her into putting it on. I will be so sad when she completely outgrows it. So much to respond to here! I am glad to hear that your husband is back home, and I hope his recovery continues to move along. What you're all going through is no picnic here! I have been thinking of you often and I'm just so impressed at your fortitude. And you're even sewing! 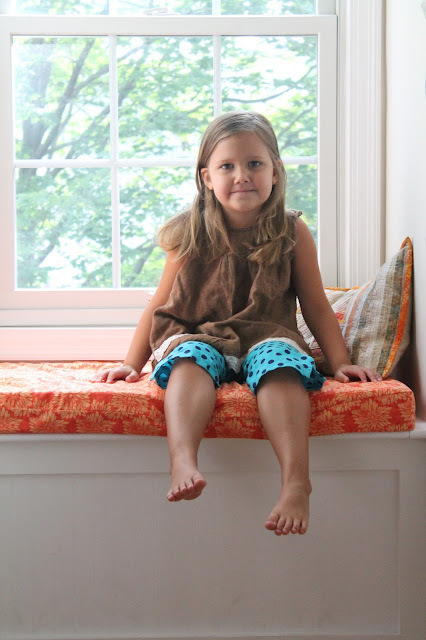 These pants are adorable - this was my first oliver + s pattern too! I've made the pants a bunch of times, and the top only once. I agree with you that the rise is a little low, and my kids tended to get "plumber's crack" in these. If I made them again, I might use the crotch curve and depth of another pair of shorts that fit a little better like the Sketchbook Shorts. I really love that top with the lace detail! And it still fits great at tunic length. I love earth tones and neutrals, but Maggie would be like "heck no" right now. Sigh. Glad to hear your husband is back home, sending prayers for a smooth transition into a new normal for your family. We always have the issue of the rise being too low for my daughters. Still figuring that out, and wah about your little one growing, it gets to me every time I look at pictures of my little ones.